It feels like you’re walking around a magical secret garden at Batsford. You can encounter other-worldly trees along with wonderful little grottos, statues and a Hermit’s Cave. There are also loads of events and activities at the arboretum for youngsters including a Forest School. 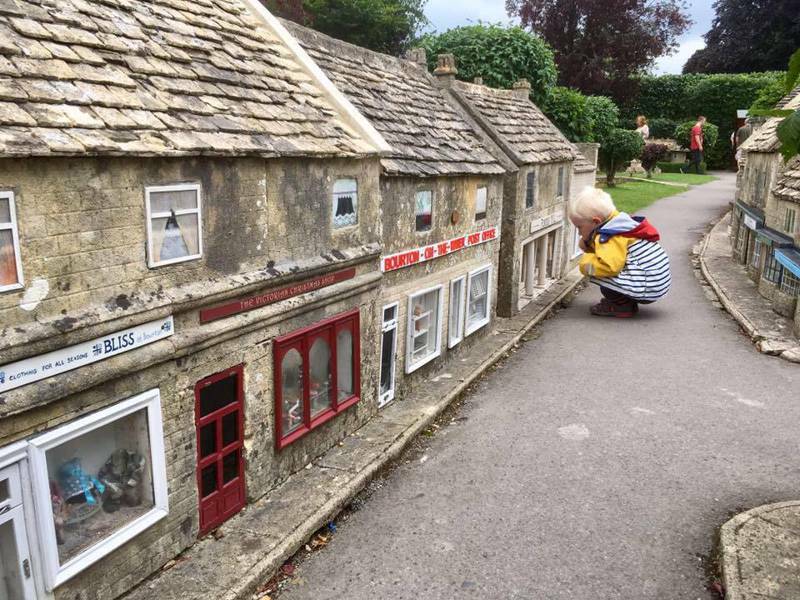 There’s the famous Model Village (miniature of Bourton), a fantastic model railway museum, a river with ducks, a motor museum and Birdland. Other things that make it special: a Christmas shop, numerous places to buy ice cream and some nice bakeries. It’s great if you get there early before all the tourists and it’s quite magical with the early morning sun reflecting off the Cotswold stone. Along with meeting and feeding animals from rare breed goats to guinea pigs, there is so much to do including: a farm tractor and trailer ride, tractor school, indoor play barns, soft play, bounce pillows, conservation area and woodland walk. The museum itself is wonderfully quaint with two floors full of Potter facts and memorabilia. A little display of the tailor and mice with a replica of the waistcoat is particularly lovely. There are little figures of most of the characters and old copies of Beatrix Potter’s famous collection. The House of the Tailor is staffed by volunteers who are both enthusiastic and knowledgeable about Beatrix Potter and her works. The museum and shop are open to the public every day. The newly opened Cheltenham to Broadway route is just perfect as the train takes you through spectacular Cotswold scenery: views of the Malvern Hills and little villages with stops at stations along the way. There are plenty of places to sit on the old-fashioned trains, including separate compartments. You can get off at a number of stations to have a picnic or visit a tea room and there are a few small museums and vehicle displays. You might also be lucky enough to go ‘up front’ to see the engine! The historical gardens were designed in the 1740s as a fanciful pleasure garden for Benjamin Hyett and his guests, this hidden valley offers spectacular views of the surrounding countryside and intriguing garden buildings. It’s a great place for kids to explore as there’s a maze and often seasonal kids trails. There are also wonderful flowers and plants to see and lovely cakes in the café! The nature centre has an abundance of things to see and do for kids with at least three great play areas, but also animal walkthroughs, a soft play barn and an amazing dinosaur ‘Step Through Time’ where you can go on a walk among large and small ‘real’ dinosaurs and discover some fascinating facts. One of the few lidos in the country that is heated and kept at an average temp of 26c in the main pool and 30c in the children’s pool. Open from April to October, Cheltenham Lido also has a sauna which is open during the cooler months, play equipment and a café selling hot and cold food. Posh soft play! It has music and children running around, but it’s a whole different experience to the usual soft play with clean equipment, two sitting areas with healthy food/good coffee and even a little reading area. Cotswold Clubhouse opened this year and is also a venue for an all ages gymnastics and trampolining club, fitness classes and creativity sessions. The museum mainly houses Roman finds and history, although it also has impressive Anglo Saxon, Medieval and Civil War collections. Other interactive stuff for kids include opportunities to dress up as a Roman or monk. Highlights for us include: the very impressive life-size Roman soldier on his horse, all the interactive games along the way, such as a mosaic making game and ‘Mrs Getty’ a Saxon lady in a coffin.